Tilapia is one of the most consumed fish species in the U.S. It has become one of our favorites, and I cook it frequently. Turns out tilapia has a lot going for it. It’s pretty inexpensive, especially if purchased in quantity (like 2 pounds or more), as filets that are individually flash frozen and vacuum sealed. I like that I can remove just the quantity I need for a specific recipe. Sustainably farmed versions are easy to find, an important consideration, since so many wild fish species are threatened around the world. Flavor-wise, tilapia has a very mild, white, flaky flesh that, I think, is a virtue. It’s a great starter fish for kids or anyone who thinks that all seafood is too “fishy”. Cooks can take advantage of its neutral flavor by using it as a base for many flavor approaches, ranging anywhere from South American, to Mediterranean to Southeast Asian. Tilapia is a lean, low-calorie source of protein that’s low in saturated fat, so it’s a good choice for healthy eating. Although it’s not an omega-3 powerhouse like salmon, a 3-ounce portion of cooked tilapia still has 10% of your daily omega-3 needs. This mild white fish holds up well to sautéing, breading, steaming, or whatever you can think to do with it. It won’t fall apart on you in the pan. It is one of the easiest, most versatile fish to cook with and it can stand whatever heat your kitchen can dish out! If you have never cooked with tilapia this recipe will introduce you in a big way; the fish loves flavor and color. A killer marinade of shallots, fish sauce, toasted sesame oil, garlic and turmeric penetrates the fish and gives it a beautiful golden color. When you sear the fish in a hot-hot pan (cast iron is best) it gets fantastically browned. This was a new way to prepare it for me and one that I won’t forget. We loved the Southeast Asian flavors. 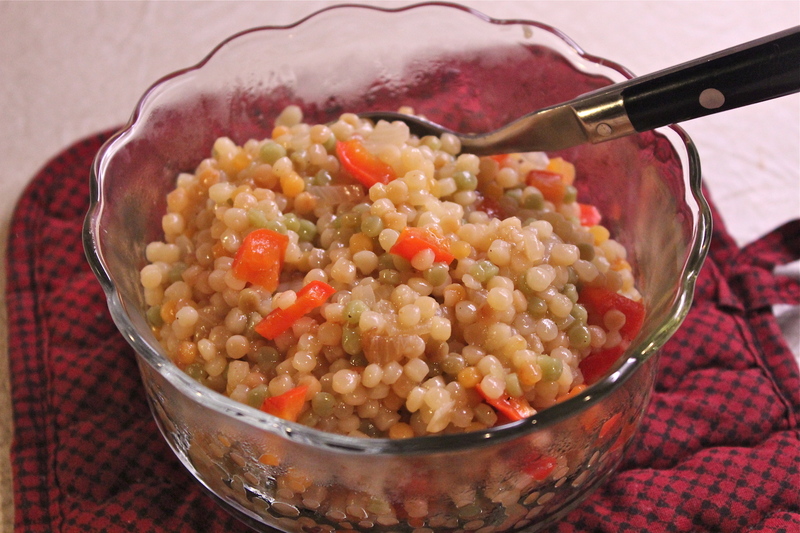 Serve it with rice and a green vegetable for an unforgettable meal. Southeast Asian seasonings provide big flavor. 1. 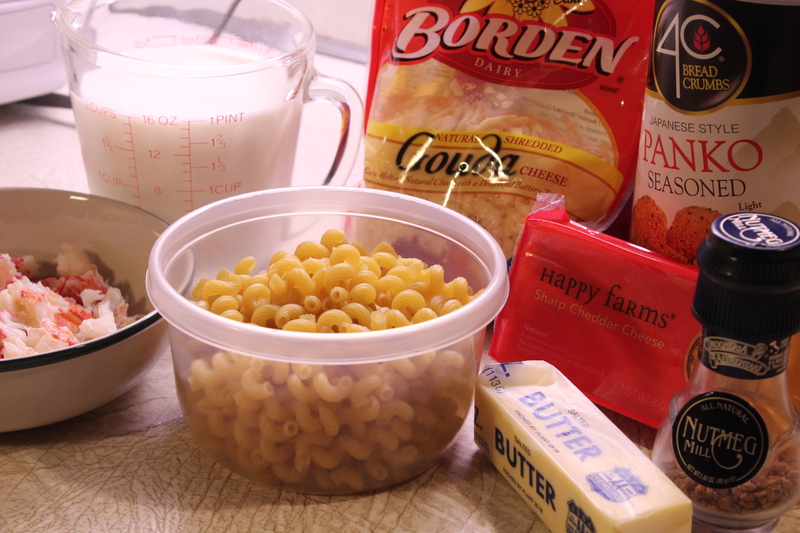 Combine first 8 ingredients in a large bowl, stirring with a whisk to combine well. Add fish; toss to coat. Cover and chill for 2 hours. Turmeric gives it a golden color. Marinate fish in the mixture. 2. Remove fish from marinade; discard marinade and solids. Combine fish and peanut oil in a bowl, tossing to coat. Remove from marinade and coat with peanut oil. 3. Heat a large heavy skillet over high heat. Coat pan with cooking spray. Add onion, 1/4 cup dill, and green onions; stir fry 1 minute. 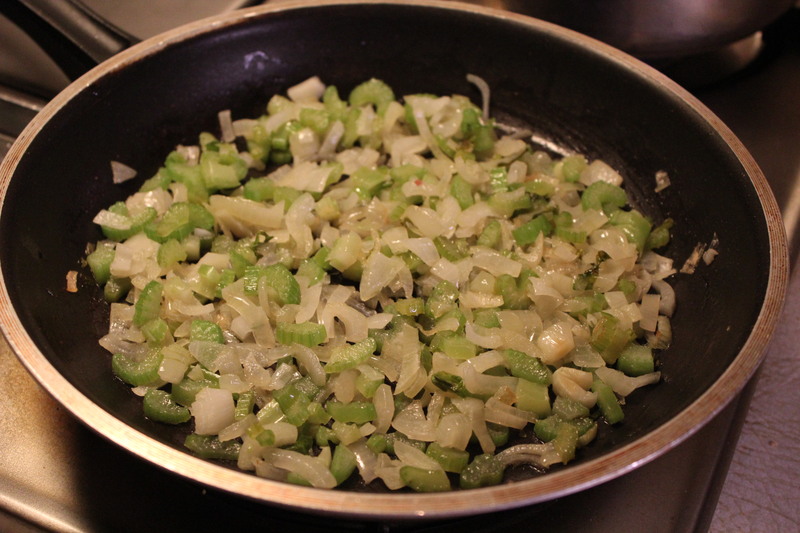 Stir frying the onions, green onions and dill. Arrange onion mixture on a platter. Arrange onion mixture on a platter. Smells wonderful! Return pan to high heat. Add the fish fillets to pan; cook 3 minutes. Turn fish over; cook 1 minute or until fish flakes easily when tested with a fork. Place fish on the platter over the onion mixture. Sprinkle with remaining dill and peanuts. Serve with lemon wedges. Arrange fish fillets over onions and serve. Puttin’ on the Ritz Stuffed Shrimp. 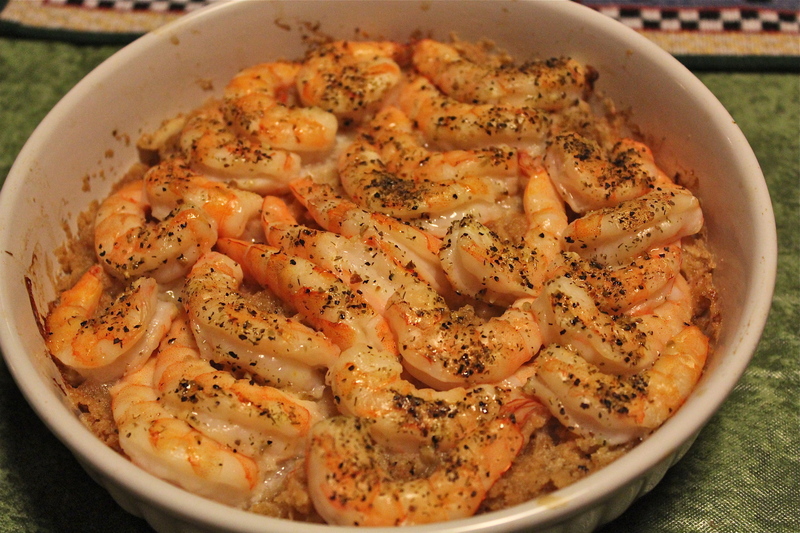 Whenever I hear the song “Puttin’ on the Ritz” I think of this recipe, so I have given it the name “Puttin’ on the Ritz Baked Stuffed Shrimp” and because I served it with a pilaf of Israeli couscous, that recipe is included here also. This meal was a really nice combination of flavors and textures. I hope you will like it. A large bag of raw shrimp was being featured at a terrifically good price at the supermarket this week, so I bought some. Not having any specific plans for using them, I like to keep shrimp in the freezer because they are so versatile, and quick cooking. But since I’m currently trying to incorporate at least one seafood meal per week, I decided to make baked stuffed shrimp with some of my ‘loot”. Now I’m sure they are many, many ways to make the stuffing, but over the years I’ve developed a recipe that we both love, and its become my reliable way to pair any kind of fish with a stuffing. What I do is make the stuffing (see recipe below), spread it in the bottom of a baking dish, and place the fish/seafood on top. Drizzle a little melted butter over the top and sprinkle with seasonings. Bake until the fish is tender. This particular recipe may be called Baked Stuffed Shrimp, but it’s my version; not the usual offering you would expect in a restaurant—same ingredients, but different look. SERVINGS: about 4 To make more adjust ingredients accordingly. 1. Preheat oven to 350*F. Lightly grease a baking dish. 2. Crush crackers and set aside in a bowl. 3. Melt 6 Tablespoons butter in a skillet over low heat. Add the onion, celery, and garlic and sauté lightly till onion is translucent. and celery is beginning to soften. 4. 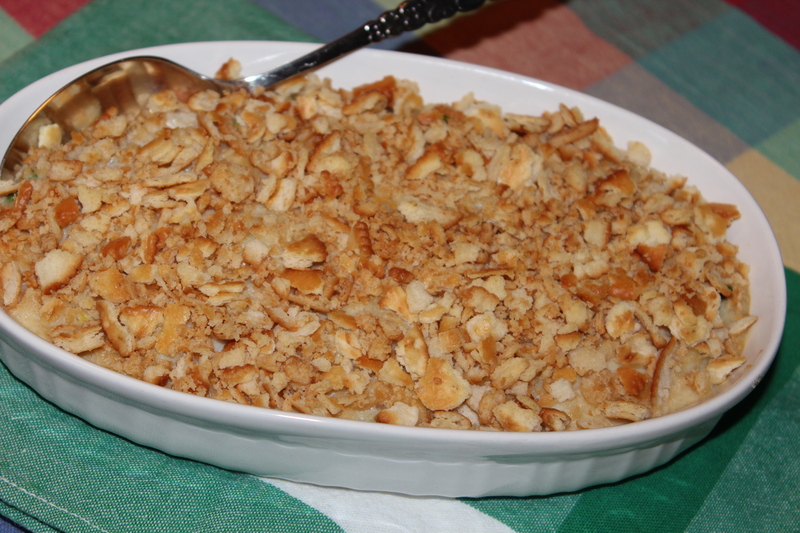 Pour the vegetable mixture over the cracker crumbs, stirring until the crumbs are completely moistened. Spoon the crumb mixture into the bottom of the baking dish, and spread in a flat layer. 5. 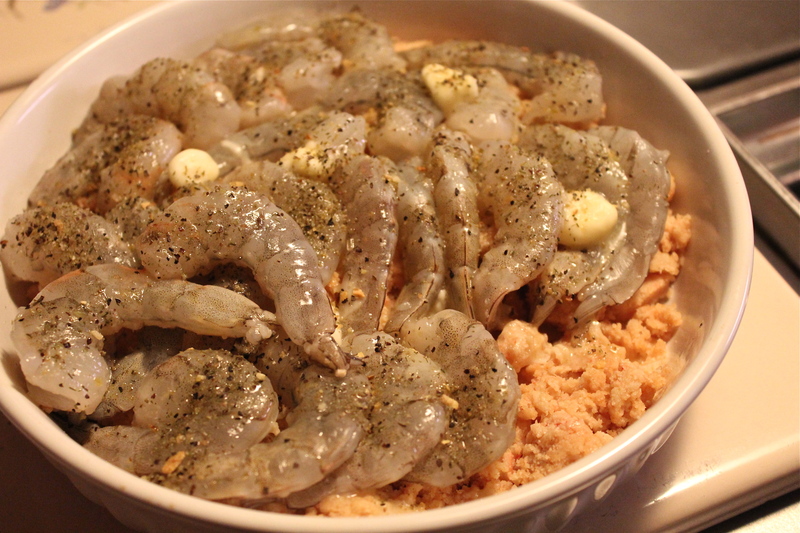 Arrange shrimp attractively on top of stuffing. Melt the remaining 2 Tablespoon butter and add the 1/2 teaspoon lemon juice. Drizzle over the shrimp. Sprinkle with seafood seasoning. 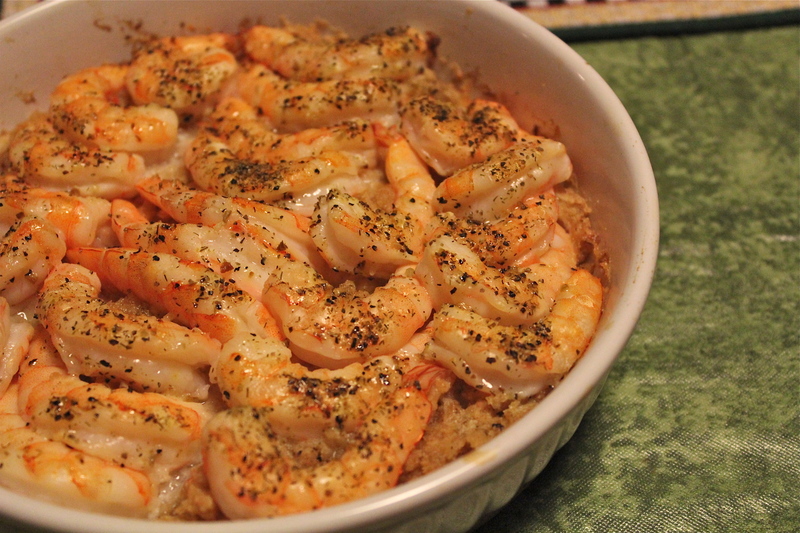 Make a layer of stuffing on the bottom, and place seafood on top. Drizzle with butter and sprinkle with seasonings. Bake till shrimp have turned pink and are tender, about 20 minutes. 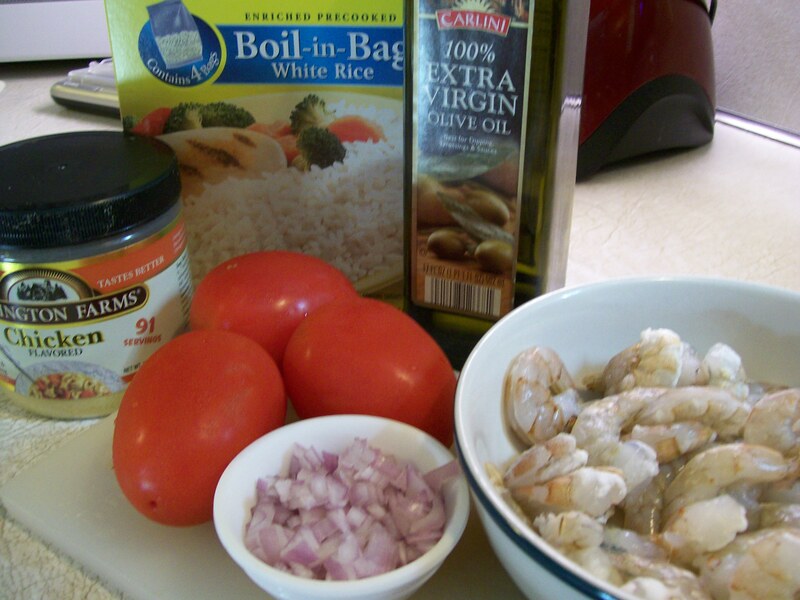 In place of shrimp you could substitute tilapia, flounder, or sole fillets. Also the stuffing can be expanded by adding in some finely chopped shrimp, crabmeat, or small bay scallops. 1. In a medium skillet, heat the olive oil. Add the chopped shallot and red pepper. Saute over medium heat till vegetables start to soften. Add the couscous and cook to lightly brown the couscous. 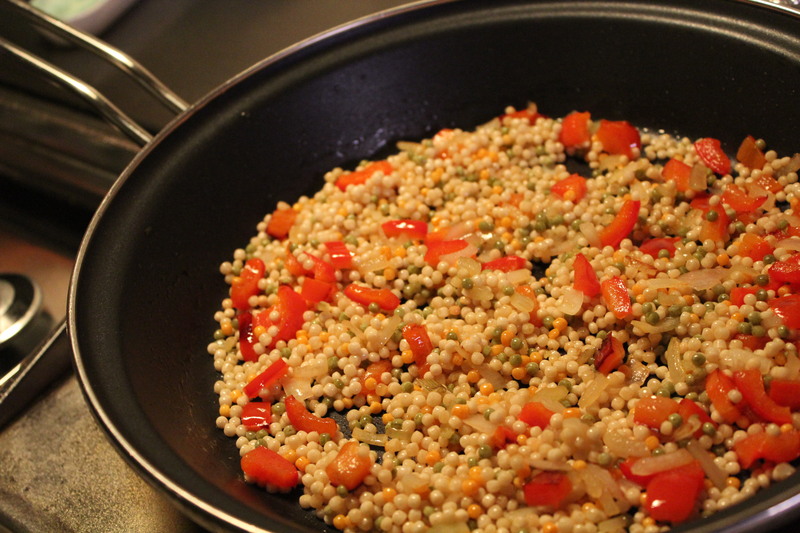 Saute shallot and pepper, then add couscous. 2. Carefully add the boiling water. Turn down heat to low simmer, and cook covered for about 8 minutes, stirring occasionally. 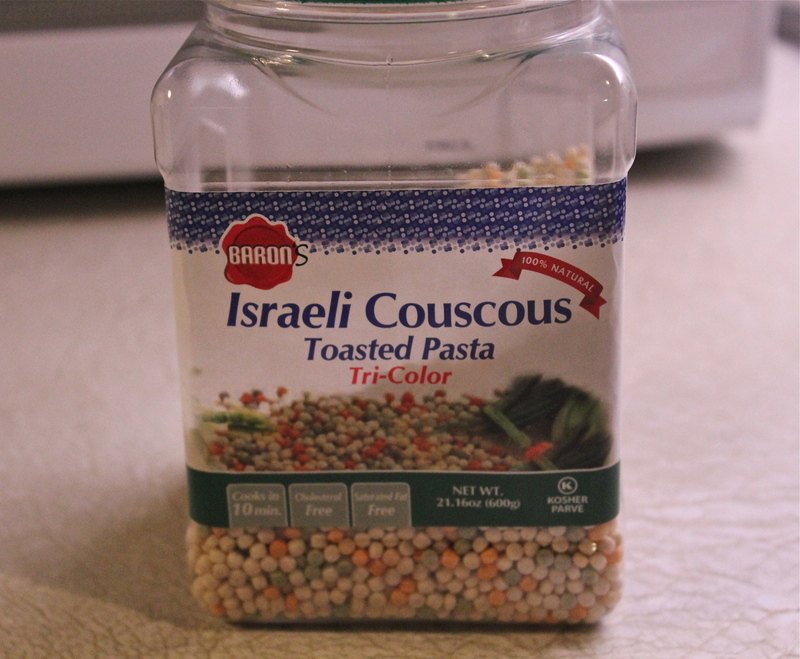 Cook couscous to al dente, or desired degree of doneness. 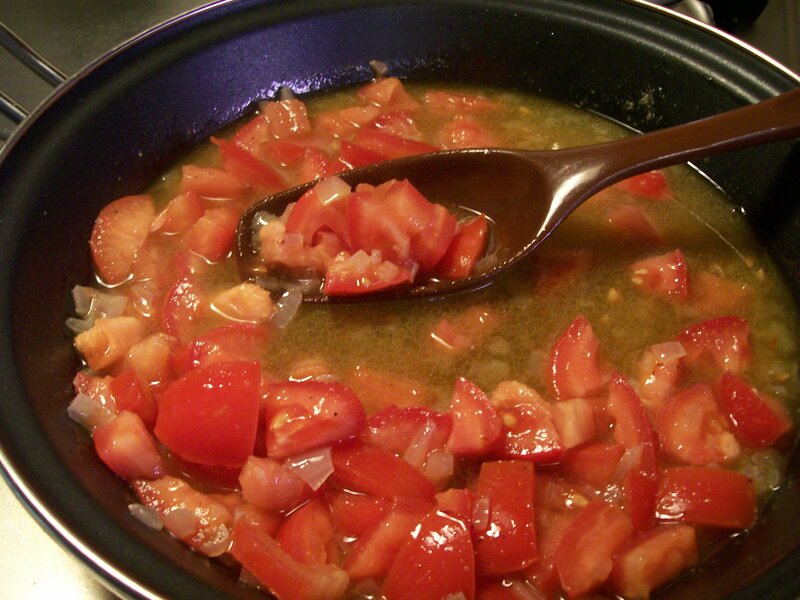 Remove from heat and leave covered another 3 – 4 minutes before serving. 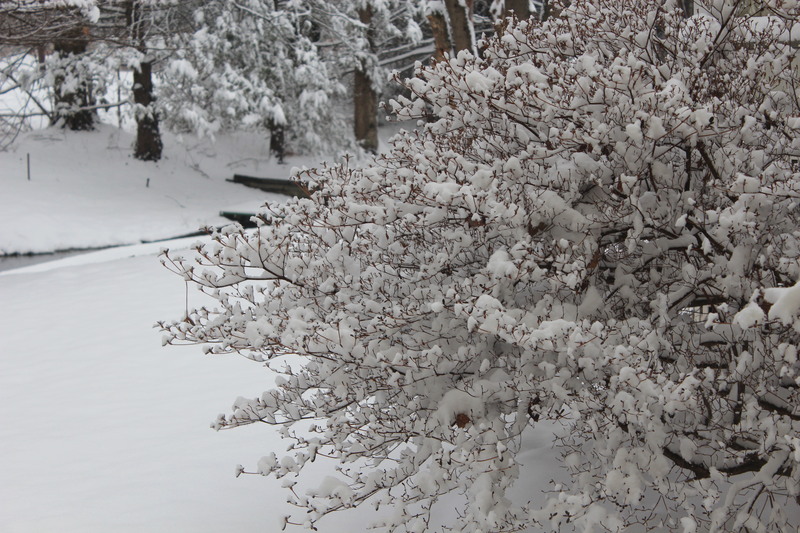 Right about now, the thermometer reads 7 degrees, with a wind-chill factor of –18*!. We are in a deep freeze and this is day number 6 of it. Brrrrr! What’s a body to do to keep warm? First and foremost, stay indoors. If that’s not possible dress in multiple layers, covering ears, nose and fingertips. What I love to do in this kind of weather is Make Soup. There is something soothing and warming just in making it, and then simmering away, it promises more warmth and comfort later when you eat it. Since I live in the Northeast, and this area is well known for its creamy New England style clam chowder, what I am making today is a variation of it called Fish Chowder (chowda, as we say). 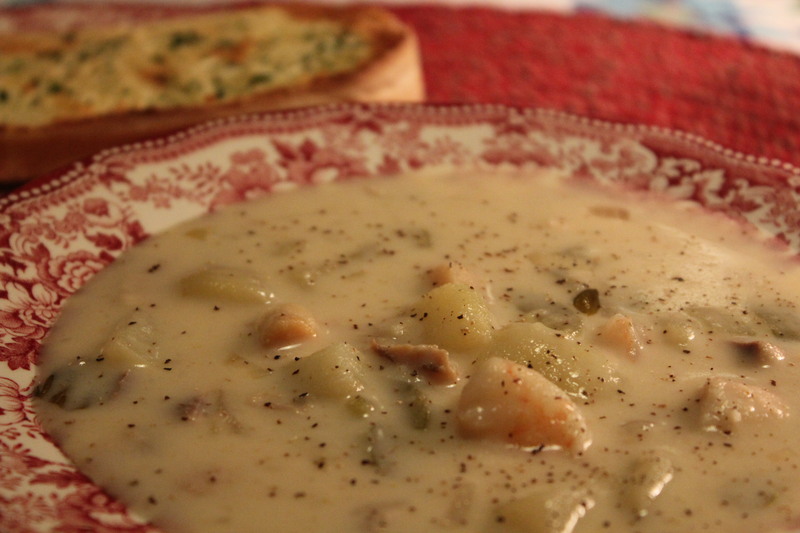 New England style chowder is a cream or milk based soup that always contains potatoes, onions, and clams or other kinds of seafood. You can make it rich and thick using cream, or lighten it up with light cream or milk. I usually make mine with milk to reduce some of the fat, so that I can use bacon and its drippings for additional flavor and to sauté the onions and celery. You may have heard of another kind of chowder that is popular here. It is a clear broth soup served mostly in Rhode Island and parts of southeastern Connecticut. 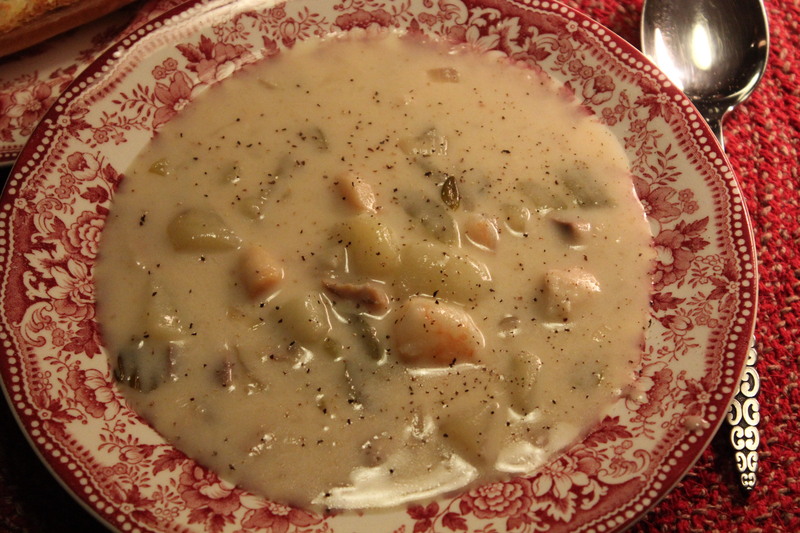 Rhode Island style chowder contains potatoes, clams, onions, lot of seasonings and a clear broth made from clam juice. Everyone seems to have their favorite kind and their own way of making it, believing that theirs is the best. My recipe is one that I have had for a long time and I think it came from a community cookbook put out by one of the churches in the area. This version is easy to make and we all love it. Top each serving with some crisp bacon bits and a shake or two of hot sauce to add a little spice. Seafood. potatoes, and bacon crisped. ***I use 1 pound cod or other white fish and then add a can of clams with their juice, some bay scallops and small-medium shrimp to make the other pound of fish. 1. In a skillet, cook the bacon crisp. Remove and drain on paper towels. Set aside till serving. 2. 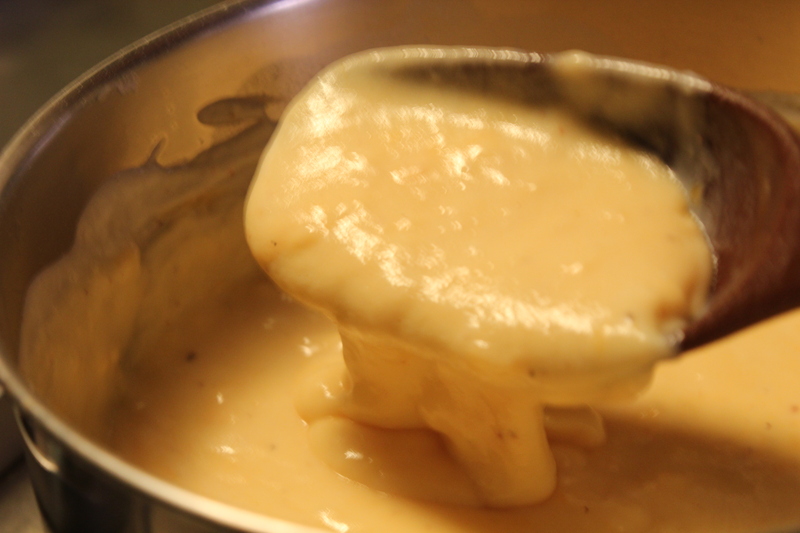 In a large soup pot melt the butter and olive oil, add bacon drippings. Add the chopped onion and celery. Sauté until tender. 3. Add chicken stock and potatoes; simmer for about 10 minutes. 4. Add the fish, and simmer another 10 minutes. 5. Season to taste with the Old Bay, salt and pepper. Mix together the clam juice and flour till smooth. Stir into the soup. Add the cream or milk and heat but do not boil. When heated through, serve in bowls, topped with bacon bits. Shake on a dash of hot sauce if you like a little spiciness. Sprinkle with bacon bits to serve. 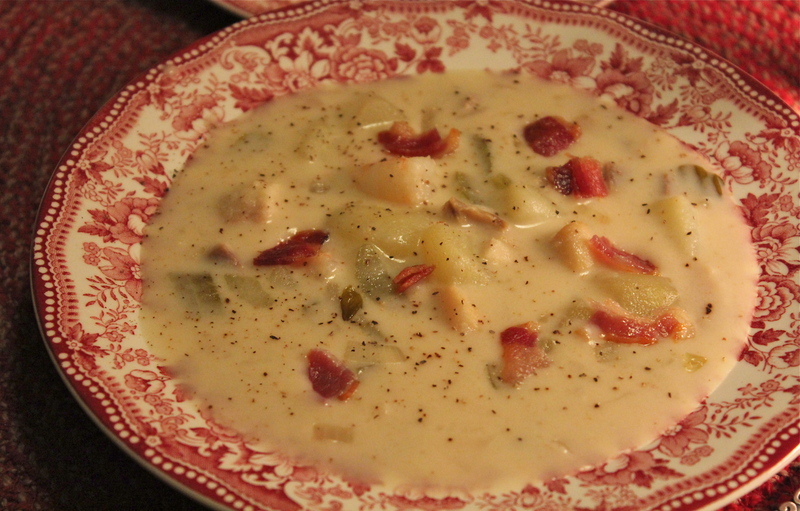 Enjoy a bowl of hearty hot chowder and stay warm, everyone. New Year’s Eve, a night when many people are out on the town, Mr. D. and I are rather low-key in our celebration. I like to splurge a little on the ingredients for a really nice dinner that includes a good bottle of wine. After dinner we usually watch a movie. That’s about as exciting as it gets around here. This year’s dinner was a baked casserole of Seafood Newburg, along with a salad of mixed baby greens, green grapes, dried cranberries and pistachio nuts, with a raspberry vinaigrette dressing. A loaf of crunchy ciabatta bread and a bottle of Pinot Grigio completed the meal. Amazingly I turned down having any dessert. I know, I can’t believe it, but that casserole was so darn good I couldn’t stop going back for more. Seafood Newburg with salad and ciabatta bread. I must give credit for the original recipe to The Ranting Chef Blog where on a Monday, the guest blogger Maggie, gave a recipe called Seafood Casserole. It looked really good so I made note to try it. Then using it as a basis I added some of my own “twists” to it to come up with this one. So thank you Pat and Maggie at the Ranting Chef for a great recipe. These are some of the additions I made. I wanted this to be a rich and decadent kind of dish so I added the meat of one small lobster to the scallops and shrimp called for. Just your everyday friendly lobster. Condensed cream of shrimp soup and spaghetti, broken into thirds. and for the topping I mixed crushed Ritz crackers, a little melted butter and the Parmesan cheese for a more substantial topping with a lot of crunch. This is without a doubt the best recipe for Seafood Newburg. Instead of mixing the spaghetti with the seafood and sauce you could serve the sauce over spaghetti, or on toast points, or in a puffed pastry shell. Once you have a good recipe like this one there are so many ways to change its presentation or how you use it. I just love its flexibility! 1/2 pound scallops, If large sea scallops, cut in half or quarters. 2. Melt 3 Tablespoons butter in a large skillet. Add the scallops and shrimp and sauté 6-8 minutes till opaque. Add the lobster meat just to heat it; then remove all the seafood to a bowl and set aside. Retain any liquid in the pan. Saute all the seafood in butter. 3. Add 1 Tablespoon butter to the pan and melt it. Add the mushrooms and sauté until browned. Remove them and set aside. 4. Empty the can of condensed soup into the skillet and over medium heat stir to smooth it out. Gradually add the 1 cup half and half, stirring all the while. Add the wine or sherry and 4 Tablespoons Cheese. Newburg sauce with peas added. 5. At this point taste the sauce and add salt and pepper as needed. Add the peas and heat through, then add back the mushrooms and all the seafood. Heat slowly over low heat, while you drain the spaghetti. Add the spaghetti to the skillet and stir to mix in. Pour all of this into the buttered casserole. 6. Melt the remaining 2 Tablespoons butter. Add the crushed Ritz crackers and stir to coat well, Stir in the remaining 4 Tablespoons cheese. Sprinkle evenly over the top of the casserole. 7. Bake at 375*F for 25 – 30 minutes till brown and bubbly around the edges. Brown and bubbly round the edges. Shrimp Scampi over linguine is one of those meals that is quick and easy to put together and most everyone likes it. I’ve eaten it in restaurants many times and sometimes it is well seasoned and balanced but I’ve also had it when the philosophy of the restaurant seemed to be ” the more garlic there is, the better”. WRONG! This dish is not about how much garlic you throw on some shrimp and linguine and then serve it swimming in clam broth. It is about the blending of flavors that include shrimp, cooked just until pink, with a light touch of garlic, lemon juice, butter, olive oil, and parsley. Serve over linguine with a good quality Parmesan cheese grated over the top and you have a dish that tells you it’s right after the first bite, when you sigh and say, Ahhhh, good. 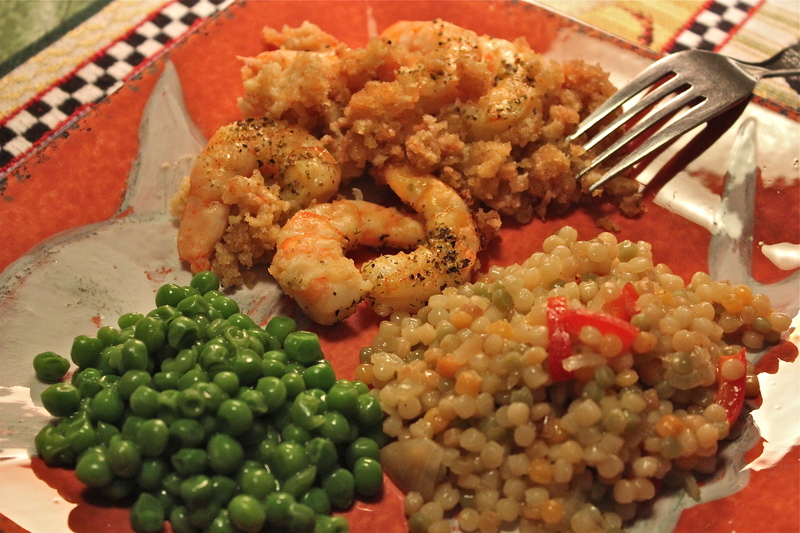 This is actually a quick pantry meal, if you keep frozen shrimp in the freezer. In addition to the shrimp you will need a package of linguine or thin spaghetti, a lemon, butter, olive oil, 2-3 cloves of garlic, and fresh flat leaf parsley. A few simple ingredients is all you need. 1. For the pasta, bring a large pot of salted water to a boil over high heat. Add the pasta and cook until tender but still firm to the bite, stirring occasionally, 8 to 10 minutes. Drain the pasta, reserving 1 cup of the pasta cooking water. 2. Meanwhile, in a large heavy skillet, warm the olive oil with the butter over medium heat. Add the minced garlic and cook for 2 minutes. Saute garlic in butter and olive oil. 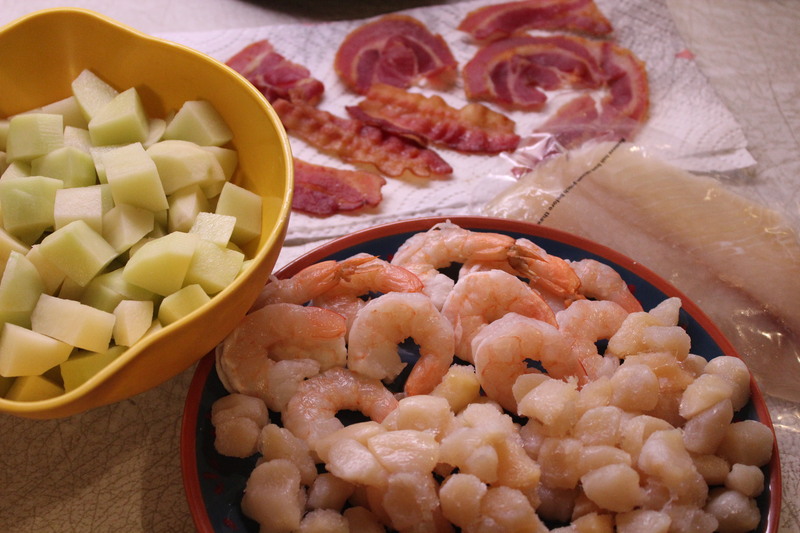 Add the shrimp and cook until pink, about 5 minutes. Add the shrimp and cook until they are just pink. Add the salt and pepper, lemon juice, lemon zest, and parsley. Toss to combine. Add salt and pepper, lemon juice and parsley. Turn off the heat and add the drained linguine, plus some pasta water; enough to make a loose consistency, but not too juicy. Add drained pasta and toss to coat. 3. Toss again to coat the pasta with the sauce. 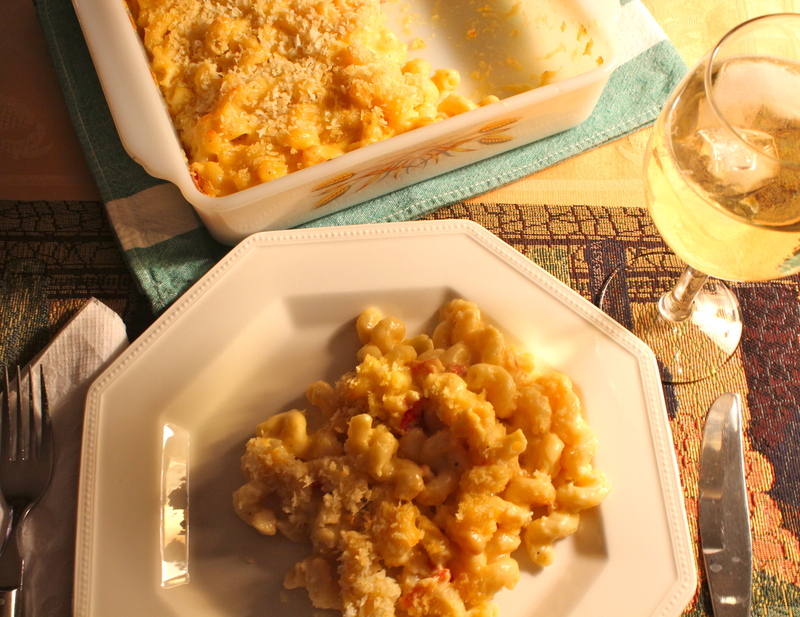 Serve immediately, with parmesan cheese to grate onto each serving at the table. Serve with grated Parmesan cheese over the top. Several weeks ago we had dinner out and one of the side dishes offered was Lobster Mac and Cheese. My husband chose this option as part of his dinner and when it arrived it looked soooo good. On tasting it he said it was the best he had ever had, so of course I had to try my hand at making it. 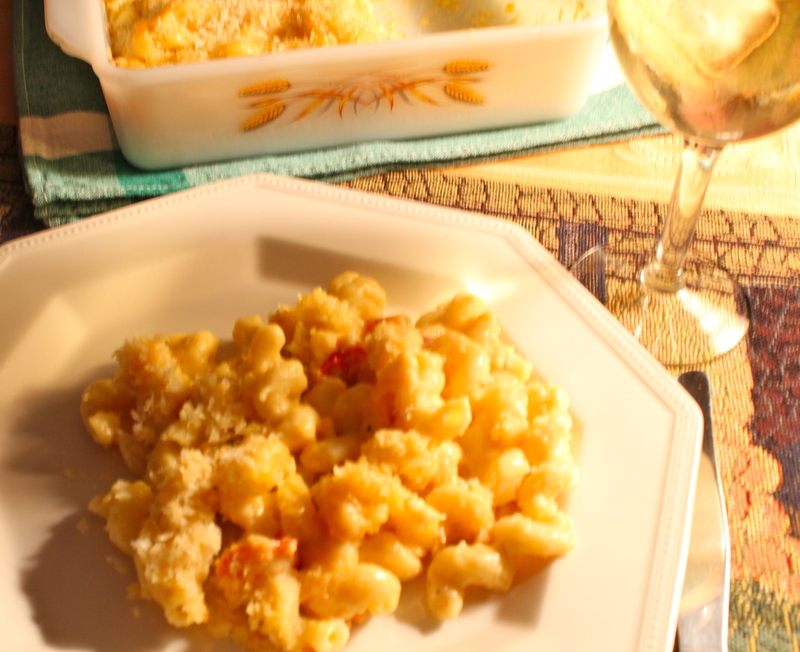 What could be so difficult about adding some lobster to basic mac and cheese? Well, before I got around to trying it out a new issue of Food Network Magazine arrived, and in it was a recipe for Lobster Mac and Cheese by Ina Garten from her newest cookbook Barefoot Contessa, Foolproof. So there was no need for me to develop a recipe when I now had one from a well-known celebrity chef. With some minor modifications, and making only half the recipe, I made it last week and my husband said it was the best he has ever eaten. ( He always knows just the right thing to say!) Without his having said that, I would have said the same thing: it is THE BEST I have ever made. 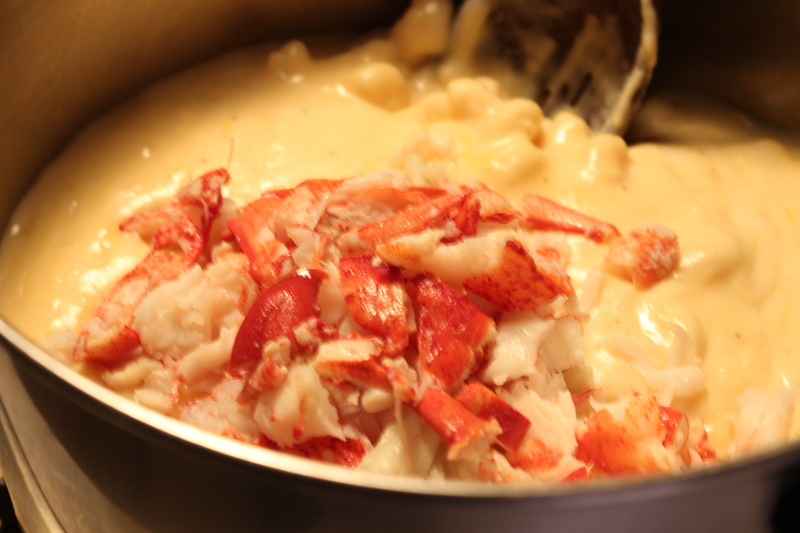 Not only does the addition of lobster elevate it above the ordinary, but the cheeses used made a velvety smooth sauce. I used Panko crumbs and butter for the topping instead of white bread crumbs, and they browned up nicely for a crunchy topping. Served with a hearty mixed greens and vegetables salad, it was a most satisfying meal. 4 cups grated Gruyere cheese ( 12 ounces ) I used Gouda cheese. 1. Preheat oven to 375 degrees. 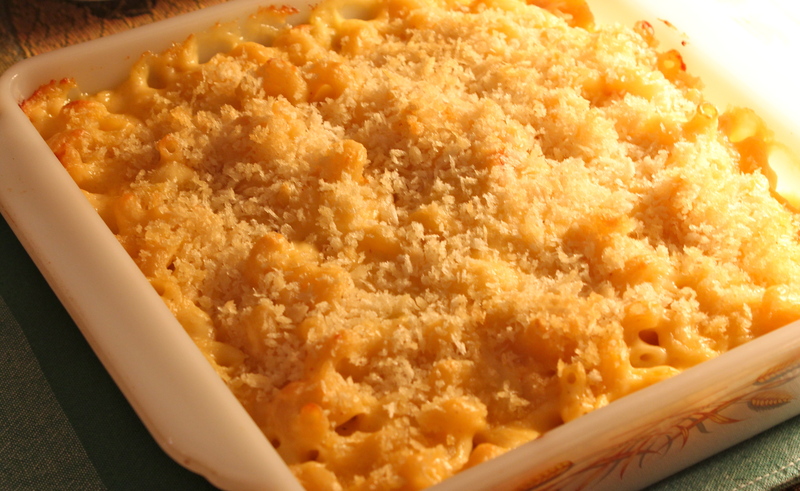 Grease a large baking dish, or several individual gratin dishes. 2. Bring a large pot of salted water to a boil. Add the pasta and cook al dente according to the directions on the package . Drain well. 3. Heat the milk in a small saucepan, but don’t allow it to boil. In a large saucepan, melt 6 Tablespoons of the butter and add the flour. Cook over low heat for 2 minutes, until thickened and smooth. Remove from heat, add the cheeses, 1 Tablespoon salt, the pepper and nutmeg and stir until the cheese melts. 4. Stir in the cooked pasta and fold in the lobster. Pile the mixture into the prepared baking dish, or dishes. 5. Melt the remaining 2 Tablespoons of butter; combine with the bread crumbs and sprinkle on top. Bake for 30 – 35 minutes, until the sauce is bubbly and the pasta is browned on top. With the remains of the crabmeat my husband brought home I made this dish. In a sense it was an experiment because I had not made it before, but I had all the ingredients on hand so I gave it a try. Backfin, or Lump: Solid lumps of white meat from the body muscles of the crab—the best! It contains very little shell or cartilage, and is preferable in special recipes such as Crab Imperial or Crabmeat Salad. Regular: Small pieces of savory white meat from the body. Still considered excellent, but takes more picking over for cartilage and shell removal. Great for crab cakes, casseroles, salad, dips, etc. Special: A mixture of backfin and regular; also fine for dishes listed above. Claws: Meat from claws has a brownish tint, and comes in thin pieces. It’s mostly used where appearance isn’t important. The crabmeat that I had came from two large crab legs, part of which I had already used for the crab cakes, and what was left weighed about half pound, so I made only half of the following recipe. The full recipe makes 4-5 servings. 1. Preheat oven to 375 degrees. Grease a shallow baking dish or individual shell dishes. 2. Remove any shell or cartilage from crab meat. Mix together all ingredients except crabmeat. Gently stir in crabmeat. 3. Put mixture in prepared baking dish(es). 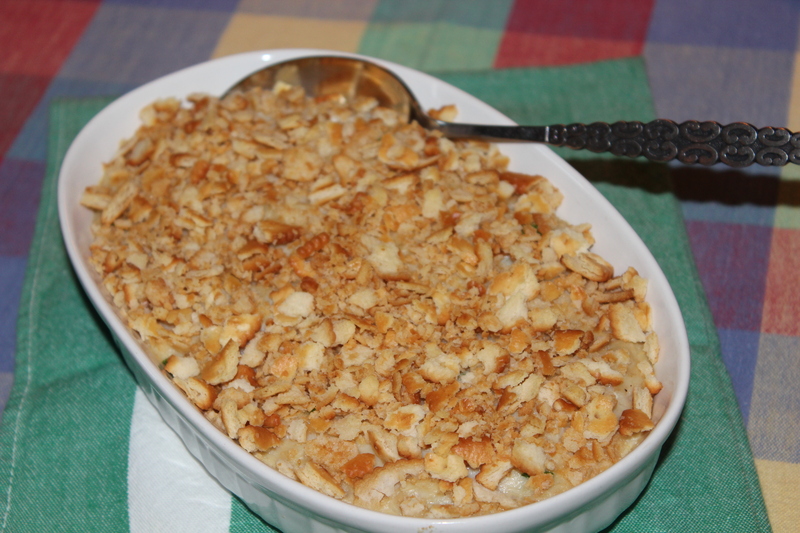 Mix crushed crackers with the melted butter, then sprinkle on top of crab mixture. Bake for 15-20 minutes. Although we both liked the dish as prepared and presented here, I think if I make it again I would modify it in the following ways: Add a few bay scallops and shrimp to the mixture for some variety in texture. Because the crab I used came from the legs, the pieces were small, and therefore there wasn’t enough “chew” factor. The overall color of the dish was rather bland, so I would add some chopped green onion, maybe some roasted red pepper for color. Lastly I think it would be more enticing if it were served in a small pastry shell like phyllo cups. These are just a few thoughts “in hind-sight” for anyone who decides to make it. If you make it and have some good ideas to improve upon the recipe I would be interested to hear about it. You’ve probably heard that saffron is the most expensive spice on the planet. Don’t be put off by that fact and neglect looking at some very interesting recipes. Because saffron’s flavor is so strong, in most instances you only need a little. Saffron is the signature flavor in such seafood dishes as bouillabaisse and paella and also in this dish that features shrimp in a tomato broth served over rice. It is also the spice of choice when making risotto in the Northern provinces of Italy. Saffron threads are actually the stigma of a particular variety of crocus. Each flower bears only 3 of these stigma,which have to be carefully harvested by hand. Somewhere around 50,000 flowers are needed to produce a single pound of saffron. After harvest, the threads are delicately roasted over carefully tended wood fires. When buying saffron look for a bright red-orange color and threads that are slightly pliable. These characteristics are a sign of freshness, as saffron tends to darken and become brittle as it ages. Saffron is usually sold in specialty stores or in ethnic neighborhood markets. 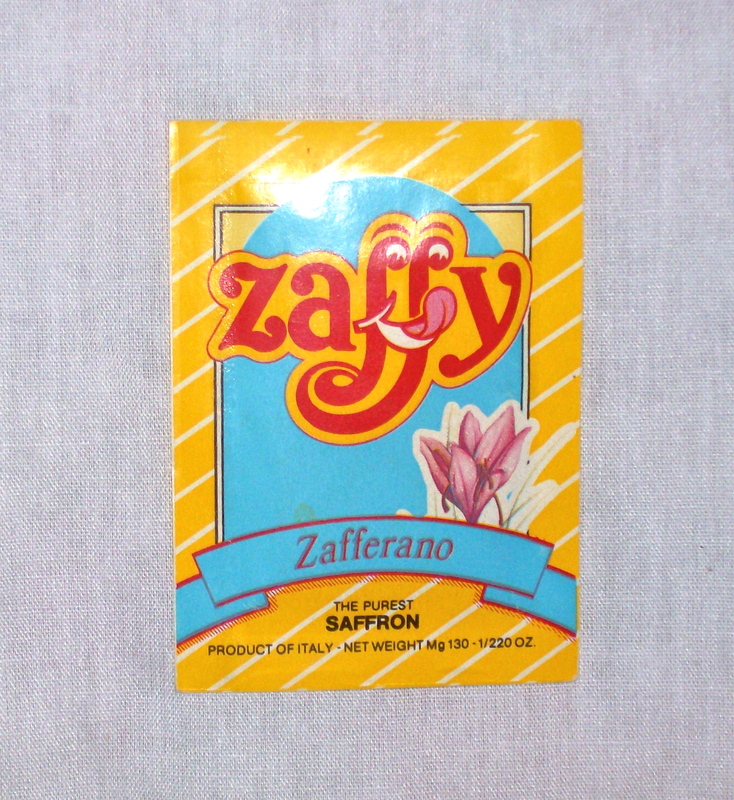 It is packaged in tiny envelopes, and as long as they remain sealed the saffron will stay fresh. I buy mine at an Italian foods market in the city closest to where I live. 1 pound large shrimp, peeled and deveined (tails can be left on). 1. Heat 2 Tablespoons of the olive oil and 1 Tablespoon butter in a large sauce pan over medium heat. Add the shallots and sauté to light golden color, about 2-3 minutes, stirring occasionally. 3. Do not wipe out the pan. Increase heat to med-high and add the last Tablespoon of oil and butter. Once hot add the shrimp in a single layer. Season with salt and pepper. Cook till brown on one side. Turn over and cook till brown on 2nd side, and opaque throughout, 1 1/2 – 2 minutes longer. 4. 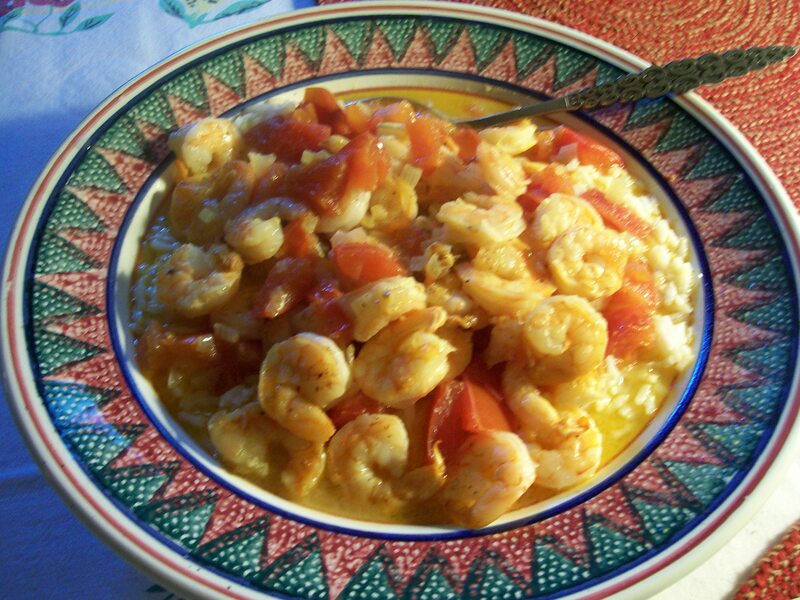 To serve: in a large serving dish, make a bed of rice, top with the shrimp and sauce.